In principle, for the pros is nothing easier than a hand-sketched schematic layout of the site. 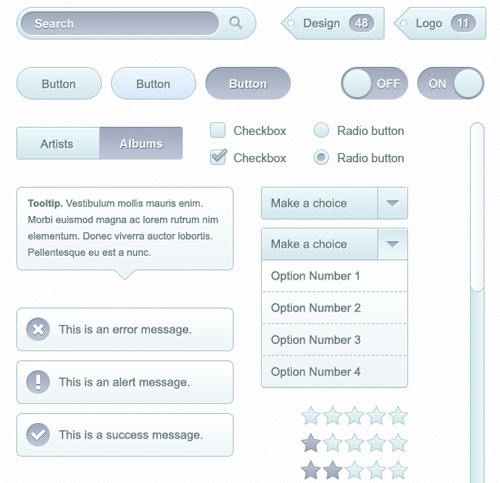 The process becomes a little trickier when it comes to the design of user interface elements (and their parts). There is not enough without imagination, experience and inspiration. If you do not know something to start (or you already have an idea, but you want to save time by using templates) you can come to the aid of special sets of elements of UI.They come usually in PSD, so that everyone who can work in Photoshop is not difficult to alter their own way. 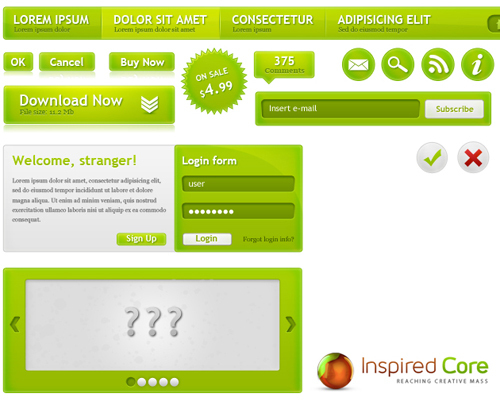 Set the interface Green WebUI Kit - includes almost all the elements that may require - the top menu navigation buttons (OK, Cancel, Buy Now, Download Now), a sticker "sale", a form for login "blank" slider and the elements of subscriptions - RSS, E-mail and more. All the elements are high quality, modern design. Each element has its own layer file (PSD), so working with them very convenient. In principle, this can quickly sketch out the design of such a blog - a slider, a subscription is already there. 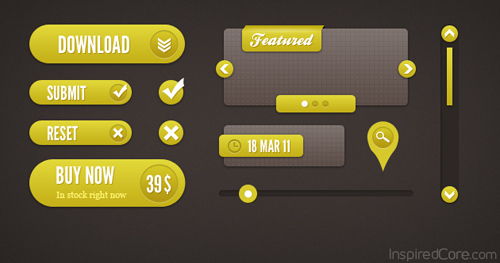 Yellow User Interface Elements - set contains 11 elements of the interface in their yellow number buttons (Download, Submit, Buy Now, Search), sections (Featured and date), scroll bars and progress. All layers in the PSD file conveniently grouped so you can easily make adjustments to one or another element of the UI. Color also can be easily changed to one that requires you (in a set of Green WebUI, of course, too). Unfortunately, Yellow UI Elements includes fewer items than the Green WebUI Kit, so do not rule out that some of the items you have borrowed from other collections or dorisovyvat yourself. 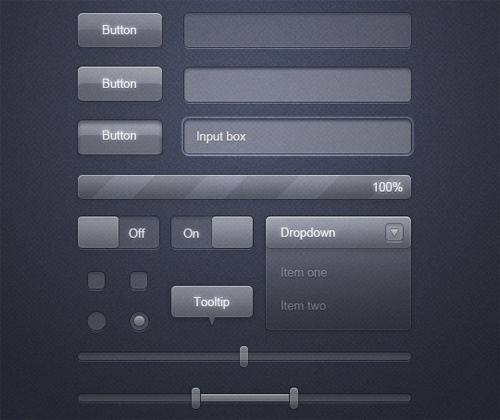 A nice light set of interface elements for your web development. Can be applied to create any site, and Web-based applications. Among all PSD sources are the most frequent elements for the web - buttons, search, drop-down list, checkboxes, and radioboksy, text, tips, etc., there are even a star to vote. Anyone who knows how to work in Photoshop, do not be difficult to correct this PSD to fit your needs. In general, set the quantity and quality is very good. As you can see from the title set (Transparent Glass UI) and a preview of its distinguishing feature is the transparent elements. First, it looks quite impressive and well fit into the modern design, and secondly, fit almost any background color. PSD set contains all the typical elements of a Web interface - drop-down lists, radio buttons, buttons, forms, sliders and input fields. I think of the presented sets of UI widgets for Photoshop will find something for yourself. The first and last sets are especially good. I wish you successful experiments and a beautiful interface!